Melinda Tognini is one of the most generous writers I know – always looking to encourage other writers, to tell other people’s stories, and to begin conversations on her blog. I was thrilled that her book, Many Hearts, One Voice: The Story of the War Widows’ Guild in Western Australia was finally published in 2015 by Fremantle Press, and embarrassed I am only reviewing it now. The War Widows’ Guild began after World War Two as women whose husbands had been killed banded together for support and to advocate for recognition and benefits. The surprise for me reading Many Hearts is how hard these women had to fight for those things; I had wrongly assumed the Australian government would have been generous to them without any pressure. Instead, it is only through advocacy – by turns patient and noisy – that they have gained the support they now have. The book weaves the history of the organisation with the life stories of the women who have been a part of it. It places this in a wider historical context, things like the effects on the organisation of shifts in gender roles and society’s values, and new wars from Korea to Vietnam to Afghanistan. Reading the book as a pacifist, it serves as a picture of the long shadow war casts over lives, the “many hearts” broken. While I doubt many of the widows share my pacifism, they are more aware than anyone of the cost of war. I was also struck by the significance of ritual for war widows. One of their continuing fights has been for recognition in ceremonies remembering the war dead, especially the opportunity to lay wreaths during these events. It speaks to the way in which, in a largely secular country, remembrance and the Anzac legend function as a civil religion. In such a system, it’s only right that war widows have a place of honour. I’ve edited several organisational histories, which makes me appreciate even more Melinda’s achievement in Many Hearts. Organisations will tend to require detail (the names of many key players and often repetitive events); encourage cosiness or self-congratulatory anecdotes / memories; and discourage the writer from playing up drama and scandal. Melinda negotiates all these challenges very well within the conventions of the genre to create an engaging narrative. In every respect, it is so well-balanced. Balanced in its mix of the personal, the organisational, and the big picture; balanced in its use of oral history, archival documents, and newspaper reports; and balanced between respectfulness and truthfulness. The book has been well published by Fremantle Press. Along with many photographs, I appreciate the reproduction of a number of key documents. It brings the reader into the history-writing process, allows them to glimpse the sources. Many Hearts comes at the right time, when the origins of the organisation are still just within living memory. It is able to preserve the voices and experiences of women which otherwise would have been lost. At a talk Melinda gave at the War Widows’ headquarters, I had a sense of the excitement of the members that their story has been told. Today marks 400 years since the Dutch explorer Dirk Hartog was meant to have left a plate behind on an island off the coast of Western Australia. I was intrigued to read Dodgy Perth’s post a while back asking questions about the truth of the event – questions I did not hear asked on the radio coverage today as WA puts on a celebration. Of course, outside the academy, anniversaries are an exercise in myth-making, not a chance to critically consider the original event. This is the irony of the state and institutional use of “history”. A parish paper states that Christ Church Grammar School originated in an earlier school that functioned between 1859 and 1872, but gives no details and does not identify any historical source to back this claim. Then in 1976 the school treated that year as its centenary. Once again, no historical source was indicated to back up this identification. I have this rather funny image of hundreds of schoolkids in 1976 dutifully engaging in “historical” busywork and ceremonies to celebrate the centenary, when it seems to have been completely made up. The past needs celebrating (or commiserating) and anniversaries should be marked, but all of it should be based on good history. Nicholas Rothwell, reviewing Cairns by Timothy Bottoms in the Weekend Australian Review, 6 February 2016, 16. Matilda Evans caught my attention when I was reading a history of Baptists in Australia. 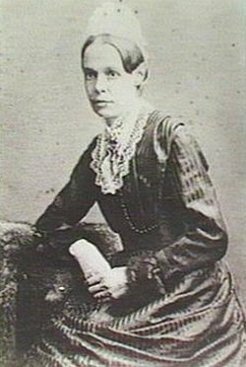 A brief profile talked of her significance as the first woman to have a novel published in South Australia (1859). In all, she published fourteen novels. She was a deaconness and married to a Baptist minister. I discovered a full-length biography of her had been published in 1994 – Our Own Matilda by Barbara Wall (Wakefield Press). Alas, Matilda is a difficult biographical subject. Despite extensive research, Wall was only able to uncover a few letters written by her, and just one photograph. If she kept a diary, we do not have it. But even if she had kept one, I doubt Matilda could ever become a compelling biographical subject: Wall does her best to redeem her and the conventionality by which she lived and wrote, but can only do so much. A number of Matilda’s novels were temperance novels; all of them were favourites for Sunday School prizes, safe novels which inspired piety and respectable living. Of course, I’m missing Wall’s main point here: she takes to task the generations of male critics who have ignored or trivialised Matilda’s writing for these reasons. Wall insists – rightly – that the novels are fascinating social documents, providing insight into South Australian colonial life and the attitudes of her time. Yet from her own argument, Matilda’s writing will be of more interest to the historian than the literary critic. The book is of interest to me for its insights into biographical method. What is the biographer to do when the subject does not reveal themselves? Wall attempts to fill the gaps by speculating on the basis of Matilda’s novels, drawing parallels to places and incidents to reconstruct Matilda’s likely experiences, fleshing out the bare facts provided by education records, obituaries and newspaper ads. It is a dangerous method, likely to be dismissed as invalid by some critics, but it seems fruitful and her suggestions reasonable. I’m sure the historical record can yield no more than this, so what more can I ask of the biographer? I’m not sure. But perhaps it could be juxtaposed with an analysis of how Matilda saw death in her novels. Perhaps something of the place of death in Victorian-era Australia. Perhaps some background on death by peritonitis at that time. Perhaps even some more speculation about the circumstances of her death, drawing on social histories of death. Perhaps none of this would work; I’m only trying to anticipate method when I come to write a biography of my own. Matilda Evans is perhaps not so neglected as Wall fears – there is another book looking at her literature; a thesis written on her and two other S.A. women writers, and an entry for her in Australian Dictionary of Biography. Abebooks reveals that her books (which remained in print right up until the 1930s) are worth hundreds of dollars. Our Matilda itself is an excellent piece of research, and a good analysis of her life and literature, aware of the shortcomings of Matilda’s writings while open to their significance.